Wine storage is not about temperature only. Humidity levels, either too high or too low, can have a detrimental effect on wine. 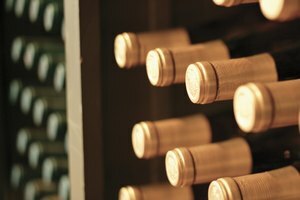 Many of the smaller wine refrigerators that have come into the market do nothing to control the humidity inside their storage level. You can solve that problem without a great deal of expense and keep the wine at the ideal humidity level of between 50 and 70 percent. You will first need to purchase a hygrometer, a device used to measure humidity in a surrounding area. Costing between $15 and $50, hygrometers can be found online. You can also find them at many local tobacconists, since the devices are often used in cigar humidors. A digital model is a bit more expensive but more accurate. After purchasing the device, set it in your wine cooling unit and wait for 24 hours. If the hygrometer reads below 50 percent you will need to raise the humidity level. Record the hygrometer reading Soak a sponge in cool water and squeeze it mostly dry. Place the sponge in your cooling unit. Wait for 24 hours before checking the hygrometer again. If after checking the hygrometer you have reached a level above 50 percent and below 70 percent, continue to dampen the sponge every three to four days. If the reading is still below 50, repeat the sponge wetting. Leave a the sponge slightly more moist and replace it the cooling unit. Again wait 24 hours. Repeat the process until you reach the ideal humidity level. You can bypass the sponge method if the humidity in your unit is extremely low, using an open bottle of water for the evaporation source.